Edvard Grieg is among the Scandinavian composers to have set the largest number of Andersen’s texts to music. As a result of his prominent status in the music of Scandinavia, these songs have enjoyed a wide distribution. Two of them are among the most beautiful musical and textual declarations of love of the nineteenth century. In 1830, much inspired by the German romantic poet Heinrich Heine, Andersen wrote a series of eight short love poems entitled Hjertets Melodier (Melodies of the Heart) inspired by his infatuation for Riborg Voigt, the daughter of a merchant in Fåborg. However, she was already more or less engaged, and was married in April 1831. When Andersen published his collection of poems Phantasier og Skizzer (Fantasies and Sketches) in January 1831 it contained both the love poems and some melancholy poems in connection with the fact that Riborg Voigt had married. The poem “Du fatter ei Bølgernes evige Gang” (“You do not grasp the eternal Movements of the Waves”) had already appeared in the periodical Læsefrugter (Fruits of Reading) in December 1830, but was later included in Hjertets Melodier. The collection Phantasier og Skizzer was dedicated to H.C. Ørsted, whom Andersen thanked in this way for support and encouragement throughout his education and introduction to the cultural life of Copenhagen. For his collection opus 5, Grieg chose four songs from Andersen’s Hjertets Melodier. The collection contains two of the the composer’s most popular songs, and these light and melodious compositions reveal him for the first time in a more mature and personal form. Grieg was in a happy and productive period during which he had just got to know his cousin Nina Hagerup better. In December 1864 he had finished composing the songs, and at Christmas that same year he became engaged to her and could then present her with this splendid musical gift. “What influenced me strongly at the time and gave rise to many romances, for example Hjertets Melodier, was my acquaintanceship with Miss Nina Hagerup, now my wife, who with her lovely singing voice and unusual delivery won people’s hearts wherever she appeared at the time. She sang my songs and has assuredly contributed to the fact that all my romances are now much better known in Denmark than at home.” (Letter to the jurist and music critic Aimar Grønvold, 24th April 1881). Grieg often stayed in Copenhagen during the years 1863–65. In the autumn of 1866 the couple returned to Christiania (now Oslo) and on 15th October 1866 Grieg arranged an inaugural concert at the Hotel du Nord to mark his return to the Norwegian capital. The songs Nina Grieg sang on this occasion included Hjertets Melodier, and the concert was a great success. 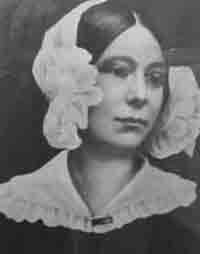 Nina Grieg sang the songs from Hjertets Melodier in particular countless times with her husband at the piano. Here they are seen together in a painting made by P.S. Krøyer in 1898. The original is in Nationalmuseet in Stockholm, NM 1571. 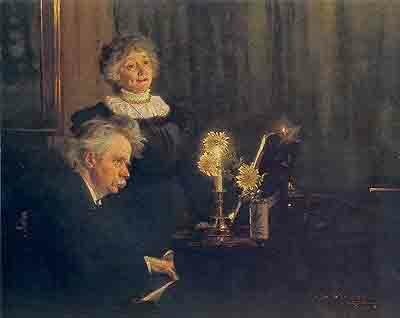 Title: “Edvard Grieg accompanying his Wife”. The song “To brune Øjne” (“Two brown eyes”) is among the best known in the collection, and it has also been revised several times by Grieg himself. One of the others, “Jeg elsker dig” (“I love you”) belongs similarly to the most endearing love songs of romance literature, and this one has likewise been both translated and arranged for various forms of instrumentation, including one by the German composer Max Reger. Grieg himself transcribed it for the piano in 1884, and in some versions it has been provided with a second verse that was not written by Andersen. In these quite simple songs, Grieg combines delicate melodic phrases with a piano accompaniment that emphasizes the melody’s interpretation of the text, for example by means of wave movements and harmonious climaxes. However, Grieg did not manage to get Hjertets Melodier published. The songs were not printed until 1865, and then at his own expense. To start with, sales were slow, even though the publication was mentioned in a notice in Illustreret Tidende which stated that the melodies were catchy and the accompaniment lively. On his departure from Copenhagen the composer gave 50 copies to his good friend the writer Benjamin Feddersen, because he did not expect them to be sold. The publication carried a dedication to Hans Christian Andersen “With admiration and respect” and on 3rd April the composer personally handed over a copy to Andersen. For his opus 15, Grieg chose two of Andersen’s poems, “Kærlighed” (“Love”) and “Langelandsk Folkemelodi” (“Langeland Folk Melody”), neither of which can be said to be among Andersen’s greatest works. He wrote the first during the summer of 1830 in Odense and it was also published in the collection Phantasier og Skizzer in 1831. The second was first published as a song text. This was in the composer Henrik Rung’s collection Tolv Sange for Mandsstemmer (Twelve Songs for Male Voices) which was published in November 1854. Edvard Grieg’s collection opus 15 consists of four songs, two of which are by Andersen. They are grouped with two songs by Henrik Ibsen, a lullaby and the song called “Modersorg” (“A Mother’s Sorrow”) inspired by Grieg’s little daughter Alexandra (born 1868) who died quite tragically shortly after her first birthday. The “Langelandsk Folkemelodi” is typical of the period by dint of its folk music inspiration. However, with its empty fifths it might seem inspired more by Norway than by Langeland. “Kjærlighed” is a beautiful romance in which the text’s description of the bay and the two lovers in the boat is represented by the accompaniment’s uneasily wavy movements. Grieg wrote the music for the two Andersen songs in 1864, but they were not published until 1867 in two of the popular Danish music periodicals of the day. It is possible that the two songs at this time should have formed part of a group of five songs (dedicated to his friend, the music teacher and composer Louis Hornbeck), but they were never printed in this form. On the other hand they were published separately, “Kjærlighed” in Musikalsk Museum in January and “Langelandsk Folkemelodi” in Album for Sang in December. The four songs were not published together as opus 15 until December 1868 in Copenhagen. Later, Grieg published “Kjærlighed” in a piano arrangement in his opus 52 Klavierstücke nach eigenen Liedern (Piano Compositions after my own Songs) (1890). The MSS for these two particular songs in opus 15 are placed together with Grieg’s songs from his collection opus 9 and were originally intended to be published together with them. However, in 1866 Grieg decided that opus 9 should only contain songs with texts by the Norwegian poet Andreas Munch, and the publisher Emil Erslev succeeded at the last moment in removing the two songs written for Andersen’s poems. It was in the course of his travels in the summer of 1829 that Andersen took lodgings at the home of a Faaborg merchant named Laurits Peter Voigt, whose son Christian was Andersen’s fellow student and a friend. Here he met the daughter, Riborg Voigt, with whom he fell in love and who was the object of the love he expressed in the poem “To brune Øjne”. The composer and conductor C.F.E. 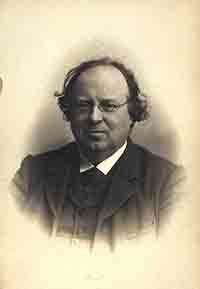 Horneman was a close friend of Grieg, and together they founded the musical society Euterpe in Copenhagen in 1865. Together with his father, Emil Hornemann, he published the music periodicals Musikalsk Museum and Album for Sang, in which Grieg’s Andersen songs from opus 15 were first printed.